On the last day of May, I just harvested the first seed of the season. Last fall, I planted some mache (aka corn salad or lamb’s lettuce) but it was too late, so there wasn’t anything for the fall, and I forgot about it over the winter. This spring, I was cleaning up that section of the garden and I found it flowering. I weeded the patch and have been working around it since. The flower heads were getting ripe and I was noticing that the seed heads were falling apart by themselves – so time to pull it all up and let the plants dry down. Do I know what I’m doing? Not really. But ever since I saved those squash seeds five years ago I seem to be using more of my own seed and there are more plants flowering in the garden than ever before. Right now I have parsnips, onions, and leeks all budding out. Growing in the garden now I have half a dozen varieties of squash, bush beans, parsnips, lettuce, and crimson clover, all from my saved seed. And I keep learning new things! Last year’s lettuce seed is a good case in point. I planted several varieties of lettuce for starts and had inter-planted them into the garden just because they look nice that way. Ellen likes to pick leaves rather than whole plants, so the plants produced lettuce for a good fraction of the summer before they finally bolted. I let them flower and, come fall, noticed that some had quite a bit of seed. My butter lettuce seed supply was low, so I harvested all of the butter lettuce seed plants and collected a pile of seed. Now, lettuce is a strong inbreeder. Carol Deppe’s book quotes authorities that claim lettuce is basically a self-pollinator and cross-pollination is rare. She also discusses the methods required to make crosses – which are all a bit tricky. My butter lettuce was interspersed with a red leaf lettuce and with some romaine. Although I anticipated the possibility of a little crossing, I was surprised by what showed up. 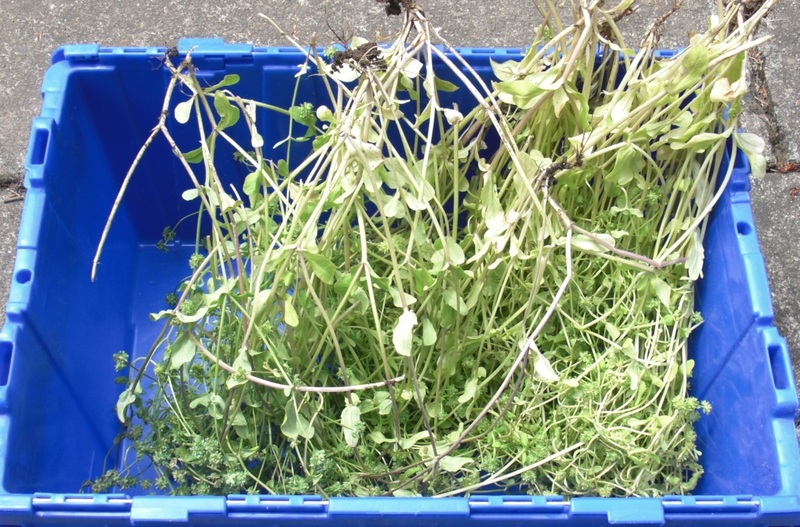 The photo shows the wide variation in color from pure green to dark red, with some forming loose butter heads and some not so much – all from this one batch of seed. Clearly I got a lot of crossing! In fact, I have very few pure green butter heads at all. Some of the crosses are really quite pretty. It would be an easy matter to start my own variety just by choosing a single pretty plant for seed. The nice thing about natural inbreeders is that they don’t have problems with inbreeding depression, so a single plant is all that is required to start a new variety. So, contrary to my understanding of the conventional wisdom, it seems that crossing lettuce plants might be pretty easy if you just interplant them closely. So should I start my own lettuce variety? Possibilities abound! Gary’s Gold needs a sister product – Gary’s Green! I assume you’re in the know about Gathering Together farm in Philomath. You should take a tour (or class?) with their seed master Frank Morton. He’s fascinating and has a particular interest in new lettuce hybrids: http://www.wildgardenseed.com/aboutus.php . We did a tour that lasted a few hours with the Master Gardeners at the conference last summer. I was dumbfounded! They are on my local seed resources list, but I have never been there myself. I’ll have to make a point to check them out. They looks like folks who know what they’re doing! I guess everyone has their cross to bear: Yours are beautiful. Did the flavor and texture cross, too? 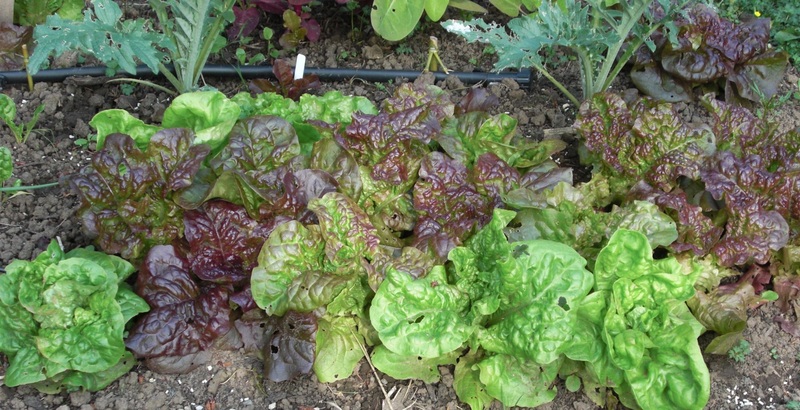 The lettuce crosses seem to tend toward a crunchy red leaf compromise. The nice heading behavior of the butter head seems hard to keep in the crosses. I’ll be curious to see how they mature – assuming Ellen doesn’t pick them all first!